• Robot motion makes minimum cycle times unbeatable. Light weight and highly rigid design results in high acceleration and minimum vibration. Maximum speed on all axes reduces move time. All this provides dramatically improved productivity. • Industry leading advanced servo gun software feature and technologies. • Improved drives and motors for accurate positioning and better repeatability. • Compact design allows closer installation in less floor space. • Power consumption reduced 15% from existing models by reducing the robot’s weight by 20% and using cutting edge motor drive controls. *1 : Load specification of number 1 arm varies according to wrist load conditions and installation position. *2 : Note that the allowable moment of inertia of wrist varies with the wrist load conditions. *3 : JIS B 8432 compliant. * Data shown in for SRA210-01A. 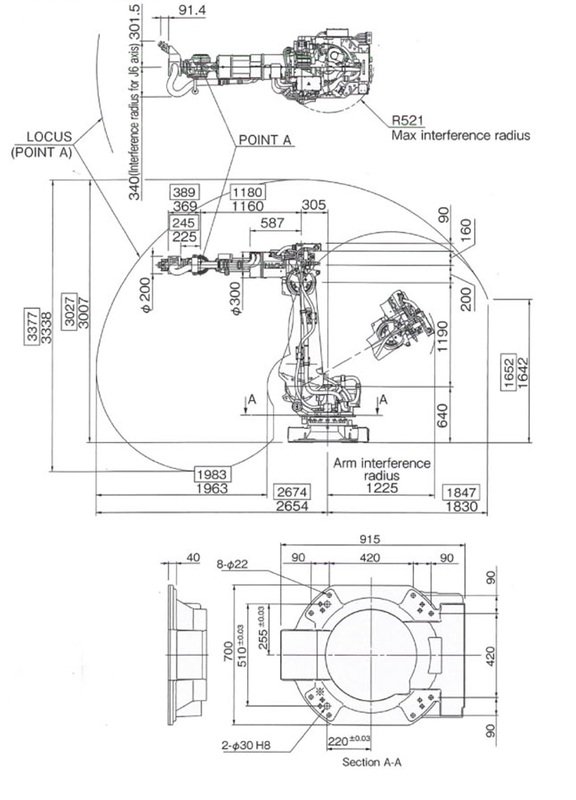 * The diagram below shows specifications for cable support (A-Trac4) installed on the arm of a spot welding robot.